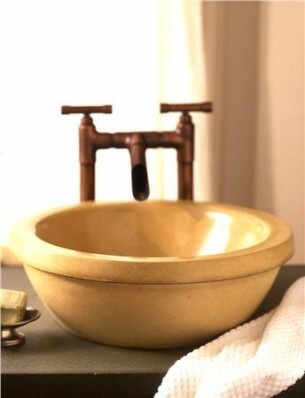 This vessel sink design is inspired by old English washbasins. These outstanding sinks combine strength, durability, and mottled color with an incredibly smooth, glassy finish. The bowls are designed and finished to be exposed above the counter surface as a vessel or partially recessed. Each sink is hand-crafted from all natural materials, and has its own unique personality. The Cabernet, Merlot and Zinfandel vessels are generously designed for the master bath. The Chardonnay and Petit Syrah styles are scaled down for powder rooms and smaller bath rooms. All are perfectly round and may be recessed into a counter at any height. Available in your choice of 24 standard colors in stain free NuCrete™. Custom colors and optional stands hand crafted of metal or hardwoods are also available.